Last night Dwayne “The Rock” Johnson stopped by NBC's Saturday Night Live to host the latenight comedy show for the fourth time. 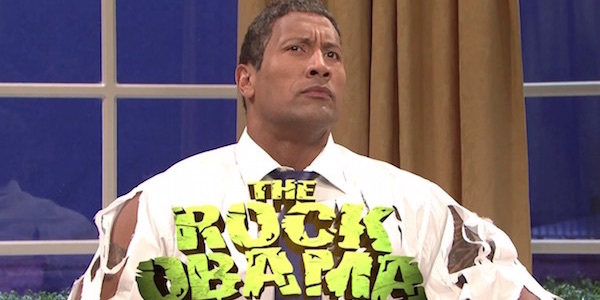 And while we were expecting him to reprise (at some point throughout the night) his hilariously iconic character The Rock Obama, a beastly version of Obama that results when the President gets very angry, it was a nice treat to see him break out of his cage in the show's cold open. Check it out below. If you hadn't previously seen the Furious 7 star embody The Rock Obama then you probably weren't prepared for what was to come during last night's cold open. 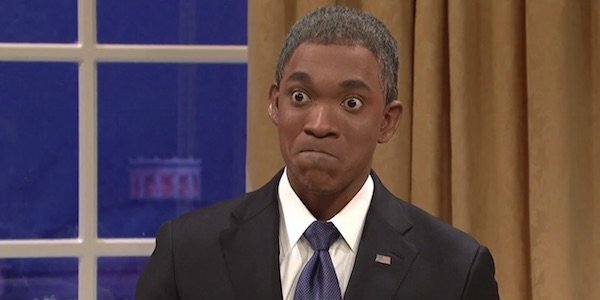 Those familiar with this ridiculously funny character last seen on SNL back in 2009 probably knew exactly where the skit was going the moment Jay Pharoah's President Obama appeared on screens. And as suspected, it wasn't long before The Rock's hulk-influenced caveman version of Obama exploded onto the screen, confirming our intuition. Of course, this time was different in that it featured Pharoah in the role of the President, rather than Fred Armisen, who played the pre-transformed Obama last time around. Pharoah didn't waste any time in last night's episode, showing his irritation with Senator Tom Cotton (Kyle Mooney) for sending emails to the Iranian government. Taran Killam hilariously embodied Rep. John Boehner as he provoked Obama further, not even bothering to provide a justified excuse for betraying him. It wasn't long before Pharoah's Obama was pushed to the brinks by the duo along with third wheel Senator Ted Cruz (Bobby Moynihan)... delivering a few classic expressions as he let his anger get the best of him. While Pharoah most definitely brought his best last night with his reliably spot-on impression of President Obama, it's that moment after he makes his transformation into Johnson's The Rock Obama that steals the show. Whether the skit appeals to you or not, it's difficult to argue the character's first onscreen appearance doesn't make a heck of an impression. It's pretty hilarious watching the San Andreas actor explain his character to his guests saying, “don't be alarmed, The Rock Obama much like Barack Obama only larger and, uh, more violent.” His calling Boehner “orange man” was too perfect as he provoked him to answer accordingly before launching him out the window—one of the skits finer moments. The skit opened so strongly, though, it left little room to ramp up. It peaked early and therefore chose to go a different direction introducing She Rock Obama (Leslie Jones) which, while funny in theory (and probably on paper), didn't quite have as good of an impact as one would hope. It was still kind of fun, I guess, and it opens up the realm of possibilities for the She Rock to cause chaos whenever they need it in future Obama SNL skits.